For those of you that do not know, I’m a current student at Full Sail University, majoring in Creative Writing for Entertainment. Full Sail University, located in Winter Park, FL, is an entertainment and media arts school. For the past four years, they’ve hosted what is known as the “Hall of Fame,” which is when they induct a handful of highly successful graduates into the history books of the school. It’s a huge honor – one I hope to one day receive waaaay down the road – and is accompanied with a week’s worth of amazing guest lectures, free concerts, and a plethora of incredible events. Today, I had the distinct honor of attending a lecture hosted by Troy DeVolld, a ’96 Film grad that has gone on to do INCREDIBLE things in the industry. He has worked on shows such as The Bachelor, MTV’s Fear, Basketball Wives, and several others. He spoke very candidly about the entertainment industry as a whole and the world of reality television. One thing a lot of people do not realize is that reality TV requires writers. Yes, writers! While the majority of the footage is candid and unrehearsed, a team of people have to sort through hours and hours of raw footage and create a storyline out of it. Reverse-engineered storytelling! A very unique and likely challenging role in the field. 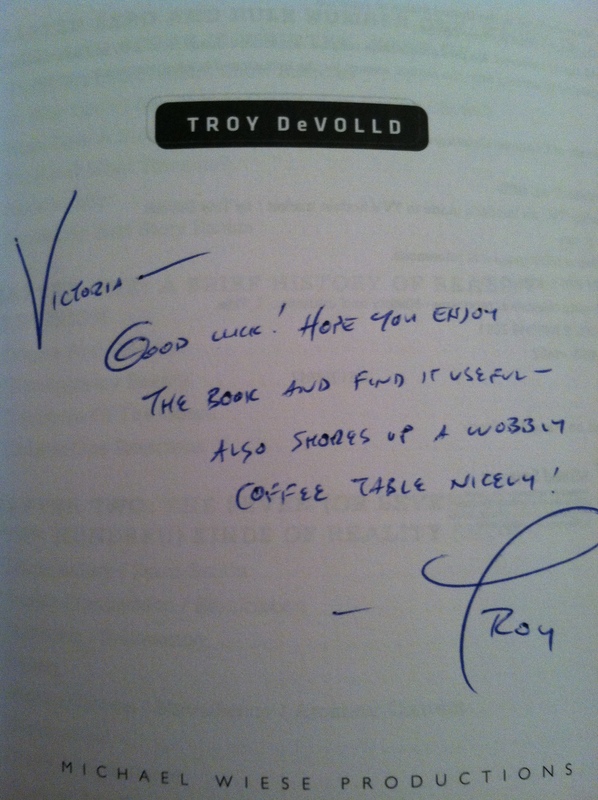 Troy is, by far, one of the nicest, most down-to-earth guys I’ve ever met. He took the time to answer questions from the audience and even passed out free copies of his books to those in attendance. He shook hands and signed copies for all of the students that wanted to meet him, which I’m sure he probably didn’t have the time to do but he did it anyway. As you can probably tell, I’m pretty in awe of this man. Yeah, that’s a personal signature. What? You didn’t know we’re BFFs? When it comes down to it, I’m blown away by people that talk the talk and walk the walk. People that announce their dream to the world, then take the steps to make it happen. People that LIVE how they say they want to live. In my new found effort to avoid hypocrisy at all costs, I will say very honestly that I do NOT do this 100% of the time. Don’t get me wrong – I’m certainly trying. I enrolled in school for a second Bachelors degree in March 2011 with the pure intent of changing my life and pursuing my dream. But that’s just one tiny facet of a much bigger picture. There is still so much that I still have left to do, changes to be made, and walking to be done. In order to live the live I want to live, I’ve still got a lot of growing, evolving, and changing to do. I’m getting there, slowly but surely. With all of that being said, however, today’s events and the whole concept of the Hall of Fame week has really lit a fire under me. I’m motivated, anxious, and ready to take the next steps towards becoming the person I want to be. I know that there will be a lot of bumps in the road, but the end goal is worth it to me. To wake up every day and know that I’m living the dream; that’s my equivalent of being inducted into the Hall of Fame. You’re making me blush! Glad that you enjoyed the lecture — I didn’t know that the school had arranged for the books to be on hand, so that was an awesome surprise. I always try to travel with just a single carry-on, so I hadn’t packed any to bring along. Love the optimism… you need it to get anywhere. There is never a time when all the stars are aligned and you have infinite resources and yada yada yada, so the perfect time to go for it is always now. By the way… I hope the motorcycle lessons work out. I’m on pins and needles. My dad used to ride before he met my mother in 1968. I’m waaaaaay too nervous. Thank you, Troy! I am an huge advocate of a positive outlook, as I believe that even though pessimists can see what’s wrong with the world, only the optimists can do something to change it. As far as the motorcycle lessons, his starts classes on the 16th of March. Between now and then, I’ll likely be buying him the biggest helmet I can find and a racing suit made entirely out of foam and bubble wrap. I can ride without a problem [my father taught me and I had a dirtbike most of my teens years], but I am definitely worried about him!